Texas fishing weather for the birds! We have a backyard that birds seem to love. And right now, they are flocking to our bird baths in the morning and evening – by the dozens. It’s not uncommon to count five common species at any given time. Nothing nearly as exotic as the flocks of parrots that used to congregate at a nearby park, but still a good indicator. It’s not that the lakes are full, which they are, but the puddles and winter cold precipitation are missing from the bird’s natural habitats. 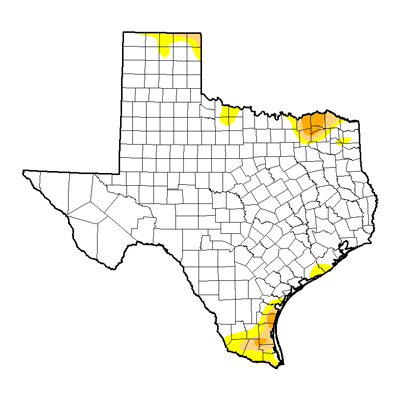 As you can see, the map looks great compared to years past, but still shows North Central Texas, and my homeland The Borderlands — dealing with dry conditions right now. I will be running a graph of the watershed’s levels next week. I can imagine there will be some coastal salinity issues if the lakes are full but holding, but no fresh rain is making its way into the river systems.